Mansaf (Arabic: منسف‎) is a traditional Jordanian dish made of lamb cooked in a sauce of fermented dried yogurt and served with rice or bulgur. It is a popular dish eaten throughout the Levant. It is the national dish of Jordan, and can also be found in Palestine, Iraq, Southern Syria and Saudi Arabia. The name of the dish comes from the term "large tray" or "large dish". The original pastoralist Bedouin mansaf underwent significant changes in the 20th century. The dish is said to originally have been made with simply meat (camel or lamb), meat broth or ghee (clarified butter) and bread. Following the popularization of rice in northern Jordan in the 1920s, rice gradually was introduced into the dish, at first mixed with bulgur, and later on its own, until the dish reached its modern incarnation of being based on white rice. Similarly, the jamid sauce is a recent development, as the Bedouins did not historically feature jamid in their cooked dishes until their modern sedentarization. Al-Karak in Jordan is known to produce the highest quality of jameed. Jameed is a hard dry yogurt that is prepared by the boiling of sheep or goat's milk, which is then left to dry and ferment. The mixture is later kept in a fine woven cheesecloth to make a thick yogurt. Salt is added daily to thicken the yogurt even more for a few days, which then becomes very dense and is shaped into round balls. The city of Al-Karak in Jordan has a reputation for producing the highest quality of jameed. A jameed broth is prepared and the pieces of lamb are cooked in it. The dish is served on a large platter with a layer of flatbread (markook or shrak) topped with rice and then meat, garnished with almonds and pine nuts, and then the creamy jameed sauce is poured on top of the dish. Mansaf is associated with a traditional Jordanian culture based on an agro-pastoral lifestyle in which meat and yogurt are readily available. Mansaf is served on special occasions such as weddings, births and graduations, or to honor a guest, and on major holidays such as Eid ul-Fitr, Eid ul-Adha, Christmas, Easter and Jordan's Independence Day. It is traditionally eaten collectively from a large platter in the Bedouin and rural style, standing around the platter with the left hand behind the back and using the right hand instead of utensils. Since mansaf was originally popular among Bedouins, much of the traditions that they used with the dish still exist today. The tray containing mansaf is placed on a table where people gather around it while standing. Mansaf should be eaten with the use of a person's right hand only while the left is behind the person's back. The hand is used to create balls of rice and then the ball is placed in the mouth through the use of three fingers. It is frowned upon to blow on the ball of rice, no matter how hot. Many of these traditions are still used; however, it can also be eaten with spoons and plates. 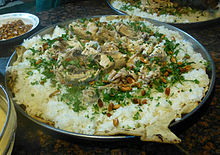 Though mansaf is frequently referred to as Jordan's "national dish", Massad states that mansaf is not a truly "traditional" dish, but is rather a more recent dish which was developed during the Hashemite-Mandatory era of the early 20th century, and then promulgated as a "national" dish following independence. Professor Joseph Massad notes that the current form of mansaf differs from the independence-era and Mandate-era recipes, but is portrayed by the state as a dish that is both national and a Bedouin tradition, despite it also historically being a dish of the peasants and Bedouins of the neighboring regions of Palestine and Syria. 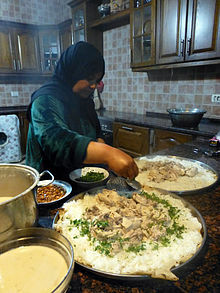 The inhabitants of Al-Salt and Al-Karak are reputed to make the best mansaf in Jordan. Other variants of the dish also exist and are adapted to the regional tastes and circumstances. These include fish mansaf, found in the south around the port city of Aqaba. An urban, less ceremonial adaptation of mansaf using non-dried yogurt is called shakreyyeh. It is sometimes cooked with poultry instead of lamb and is common in the northern part of Jordan. ^ "Jordanian cuisine". kinghussein.gov.jo. kinghussein.gov.jo. 2010-02-04. Retrieved 2016-04-19. ^ Alan Davidson; Tom Jaine (2006). The Oxford companion to food. Oxford University Press. p. 424. ISBN 978-0-19-280681-9. Retrieved 23 July 2012. ^ Ghillie Basan (30 September 2007). Middle Eastern Kitchen. Hippocrene Books. pp. 70–. ISBN 978-0-7818-1190-3. Retrieved 23 July 2012. ^ Joseph Andoni Massad (1998). Identifying the nation: the juridical and military bases of Jordanian national identity. Columbia University. p. 233. ^ a b Joseph Andoni Massad (2001). Colonial Effects: The Making of National Identity in Jordan. Columbia University Press. pp. 316–. ISBN 978-0-231-12323-5. Retrieved 23 July 2012. ^ Albala, Ken (2011-05-25). Food Cultures of the World Encyclopedia [4 volumes]: [Four Volumes]. ABC-CLIO. ISBN 9780313376276. ^ Sonia Uvezian (2001). Recipes and remembrances from an Eastern Mediterranean kitchen: a culinary journey through Syria, Lebanon, and Jordan. Siamanto Press. ISBN 978-0-9709716-8-5. Retrieved 23 July 2012. ^ "«الجميد الكركي» .. الخلطة السرية لانتشار شهرة المنسف الأردني". Ad Dustour (in Arabic). Ad Dustour. 2009-04-28. Retrieved 2016-04-19. ^ "المنسف الأردني.. حاضر في الأعراس وسرادق العزاء". Al Araby (in Arabic). Al Araby. 2016-02-13. Retrieved 2016-04-19. ^ Joseph Massad (1998). Identifying the nation: the juridical and military bases of Jordanian national identity. Columbia University. p. 233. Retrieved 23 July 2012. ^ Roger Heacock (2008). Temps et espaces en Palestine: flux et résistances identitaires. Institut français du Proche-Orient. p. 289. ISBN 978-2-35159-074-4. ^ Sonia Uvezian (2001). Recipes and remembrances from an Eastern Mediterranean kitchen: a culinary journey through Syria, Lebanon, and Jordan. Siamanto Press. ISBN 978-0-9709716-8-5. Retrieved 23 July 2012. The best mansafs are reputedly found in the towns of al-Salt and al-Karak. ^ "المنسف.. سيد الطعام العربي". Ad Dustour (in Arabic). Ad Dustour. 2011-12-16. Retrieved 2016-04-20. The Jordan Heritage Encyclopedia/ vol. 1–5: Rox Bin Za’id Al-Uzaizi. Cultural history of Jordan during the Mamluk period 1250–1517. Professor Yousef Ghawanmeh. 1979, Workers Cooperative Society presses. Amman, Jordan. 1982, Yarmouk University. Irbid, Jordan. 1986, Ministry of Culture and Youth. Amman, Jordan. 1992, University of Jordan. Amman, Jordan. This page was last edited on 10 February 2019, at 07:51 (UTC).